An improperly discarded cigarette is suspected to have caused a multiple-alarm fire on Wentworth Street South on Tuesday afternoon. Taylor Horner, 21, and her four-year-old daughter, Triniti, were watching Disney movies Tuesday afternoon in her third storey apartment when suddenly Horner started smelling smoke. 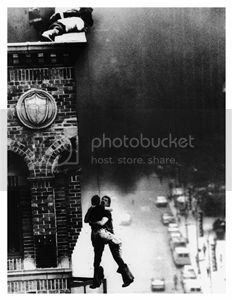 By then, firefighters were arriving on scene and put up a ladder to her window. They rescued Triniti first, then came back up for Horner, she said. Horner said she was in another fire as a kid. She didn’t even have time to think before she jumped into action, she said. 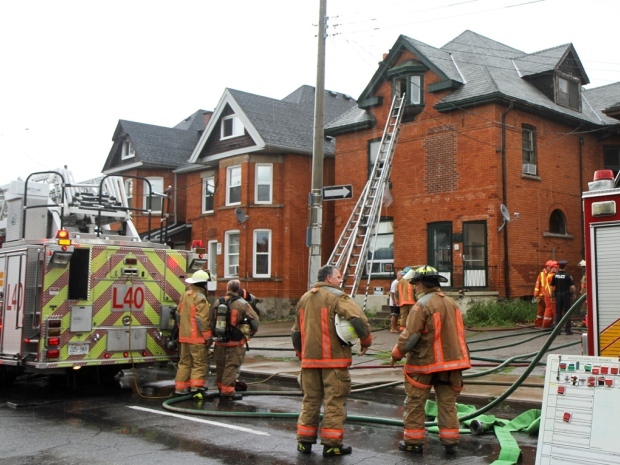 Hamilton firefighters rescued another woman from the second storey of the building, which is split into a number of apartments. Paramedics transported her and the four-year-old to the hospital as a precaution, said Hamilton Fire spokesman Dave Christopher. The fire was a multiple alarm call for firefighters that shut down the block of Wentworth between Main and King streets for more than an hour. The department sent 10 units to the scene, along with police and ambulance vehicles. The fire was contained in one apartment on one side of the house, Christopher said, but much of the house was filled with heavy smoke. The fire is estimated to have caused $70,000 in damages, Christopher said. The Red Cross was brought in to help with tenant relocation until the house can be inhabited again.